1. Preheat the oven to 200°C or gas mark 6. 2. Grease or line the baking tray. 3. Sift the flour and salt into the mixing bowl. 4. Stir in the yeast and make a well in the middle. 5. 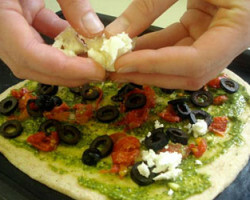 Add the oil and enough warm water to mix into a soft dough with your hands. 6. Turn the dough out onto a lightly floured surface and knead for 5-10 minutes. 7. Place the dough in the bowl, cover with cling film and allow to prove in a warm place for 15 minutes. 8. Roll out and shape the dough into a rectangle. 9. Place the dough onto the baking tray. 10. Spread the pesto on the base almost to the edge of the pizza with the palette knife. 11. Thinly slice the sun dried tomatoes and olives. 12. Arrange the tomato and olives on top of the pizza. 13. Crumble the feta cheese on top. 14. Bake for 10-15 minutes. 15. Remove from the oven and place the pizza on the cooling rack. 16. Roughly tear the basil leaves and sprinkle over the pizza. Use different types of flour for the base such as wholemeal or maize. Vary the toppings on the pizza. Serve with a salad.